At Sports & Spinal we offer top quality Core Strength and Mobility (CSM) classes, these classes are based on Clinical Pilates Exercises. 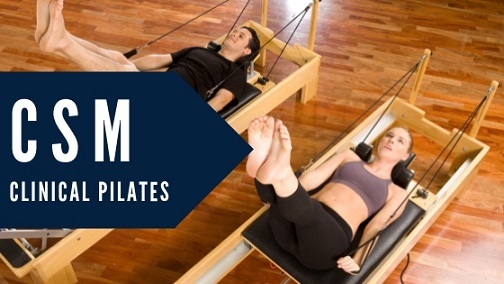 With an emphasis on core conditioning, breathing and body awareness, our CSM classes are a safe and highly effective way to stretch, strengthen and streamline your body without building bulk or stressing your joints. CSM classes utilise a variety of exercises that incorporate balance, power, strength and stability. the classes are inspired by clinical Pilates movements and equipment, utilising levers and resistance to promote correct muscular activation patterns, postural awareness and core strength. At Sports & Spinal Physiotherapy we offer four different classes. this is a small group class (maximum of 6 participants) suitable for beginners and those new to clinical Pilates exercises. this class runs through fundamental exercises and is a perfect starting point to prepare you for progression into our intermediate and studio classes. This class is the next step after the Beginner’s course. New exercises are introduced and are progressively more challenging. This class is suitable for those with a good understanding of clinical Pilates-based exercises. These classes include more complex moves and exercise flows to challenge strength and coordination. The equipment adds another dimension to mat work and targets areas that can’t be reached with mat work exercises alone. The equipment adds more resistance and therefore increases toning benefits for the entire body. These classes are suitable for beginners with every session tailored to your individual needs. What makes doing our CSM classes different to a Gym/Pilates Studio? Our classes are instructed by fully qualified Physiotherapists and Exercise Physiologists who will utilise their expertise to ensure you maximise your recovery and achieve your goals in a safe, friendly and professional environment. Our therapists can also tailor exercises to help you reach your fitness goals. To ensure you get the most out of our classes, it is vital to perform an assessment in rooms to ascertain your goals and tailor a program specific to your needs. During this consultation, you will be shown the equipment and the basics of our classes. You will also be told which class you would benefit most from. If you have an injury or condition, let your therapist know as this will enable them to tailor your program to your individual needs. We are pleased to let you know we are now offering 2 weeks of FREE classes when you book in a class initial assessment. This allows you a risk-free period to see if our classes are right for you! 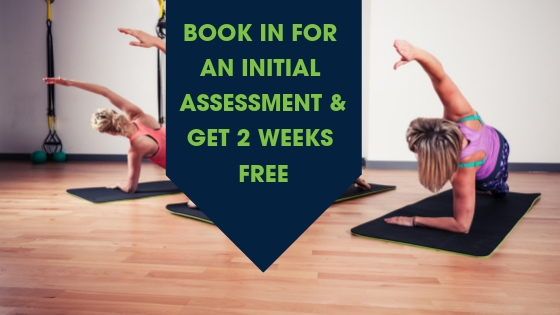 Contact your local clinic to book in your initial assessment today and gain access to 2 weeks of unlimited FREE classes. Do I get a rebate back from my health fund? How much will they rebate per class? Yes and we can do on the spot claiming if you pay as you go. Unfortunately, we won’t know how much you’ll get back until we swipe your health fund card through our hicaps machine. If you’d like to know prior to joining our classes you can call your health fund to enquire. What do I wear to these classes & do I need to bring anything in particular? When doing our classes wear a singlet or T-shirt and some tights or shorts. Anything you can move freely in and feel comfortable stretching in etc. We don’t wear shoes in our classes so bring along some socks. You’ll need a towel with you and a drink bottle is optional. Everything else you’ll require is supplied for you. How often should I do your CSM classes? We suggest doing our mat and/or equipment classes at least once a week, although we do encourage you to commit to a regime for 2-5 sessions a week, whether that be additional classes or a home-based exercise. I’ve done Pilates Classes before. Do I need to have an initial consultation? Yes. We like to assess what level you’re at so that you’re definitely going into the right class. If you feel that you know which class you’d like to do just give us a call and we will happily chat with you! Contact your local clinic to book in for your initial assessment!